If you’ve read many of our kids’ bios here, you know that we try to paint an accurate picture of their strengths and struggles. Some of our kiddos are high maintenance, and that’s OK. They’re worth every ounce of energy it takes. But others are so relaxed, so carefree, and so low maintenance that we can’t believe families aren’t kicking our doors down ready to adopt them. That’s the case for Makiah. She’s just as beautiful inside as she is on the outside! We asked her foster parents about Makiah’s struggles, and they really had a difficult time thinking of any! Makiah just really wants a forever family and can get a little anxious about the prospect. Otherwise, she is a soft-spoken, big-hearted, really intelligent young woman who wants and deserves an amazing family of her own. Makiah told us that she wanted a mom and a dad (or even just a mom…sorry dads!) who would let her keep her cell phone and wear makeup. Easy, right? 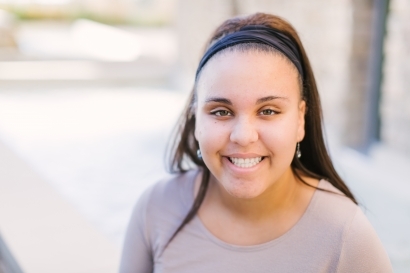 Makiah is an amazing, funny, laid-back young woman who just needs someone to open their hearts to adopting a teen. Is that you?